Napili / Kapalua: 65 min. Wailea / Makena: 40 min. TRAVEL NOTE: Arriving to the harbor early will ensure that you have a chance to secure the best, and most convenient, parking spot. Take HWY 30 south. You will travel along the coast for a while and eventually come to Maui's only tunnel. About three (3) miles after the tunnel, there will be green highway sign reading "U.S. Coast Guard Station". Turn right, down into the harbor. When the road into the harbor splits, take the left hand side. Go past Buzz's Wharf (a restaurant) and continue on through the harbor. Our slip (#55) is almost directly across from the Beach Bums Restaurant. There is paid parking in the harbor, but the earlier you get there, the better your chance is of finding parking near the boat at SLIP #55. 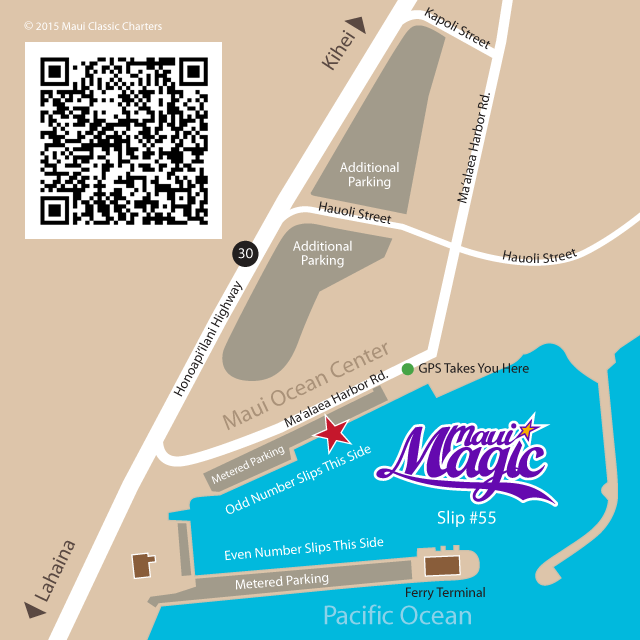 There is additional free parking up above by the Maui Ocean Center. Allow 35-45 minutes for the drive (depending on your departure point). Take South Kihei Road north to HWY 30. South Kihei Road will end at a "T" intersection at a traffic light. Turn left onto North Kihei Road at the "T" intersection. Continue on this road until you come to another "T" intersection (and traffic light) and turn left (towards Maalaea and Lahaina). Turn left at traffic light by Maui Ocean Center (Kapoli Street) where you will see Carl's Jr. and a gas station located on the corner. Then take Kapoli Street down to the end and turn right onto Maalaea Harbor Road. Go past the Coast Guard Station and find the first parking space you can find. The earlier you arrive, the better your chance of finding paid parking near the boat at SLIP #55. There is additional free parking up above by the Maui Ocean Center. Allow 25-40 minutes for the drive (depending on your departure point). Take HWY 380 west to HWY 30. At the 2nd stoplight (where HWY 380 ends) turn left onto HWY 30. Follow the signs to Maalaea. Turn left at stoplight by Maui Ocean Center (Kapoli Street) where you will see Carl's Jr. and a gas station located on the corner. Then take Kapoli Street down to the end and turn right again onto Maalaea Harbor Road. Go past the Coast Guard Station and find the first parking space you can find. The earlier you arrive, the better your chance of finding paid parking near the boat at SLIP #55. There is additional free parking up above by the Maui Ocean Center. Allow 30 minutes for the drive. Since Maalaea harbor is off the main highway/roads, most GPS devices can not fix (or find) a proper GPS way-point for the actual location of the harbor. So the best way to use your GPS device, to navigate to our harbor slip, is to navigate to the address below (which takes you to the entrance of the harbor). Or you can also scan the QR code (in the map) into your smartphone. Paid parking is available in the harbor but parking is LIMITED. Try to get to the harbor early enough to secure a parking space that is close to Slip #55. 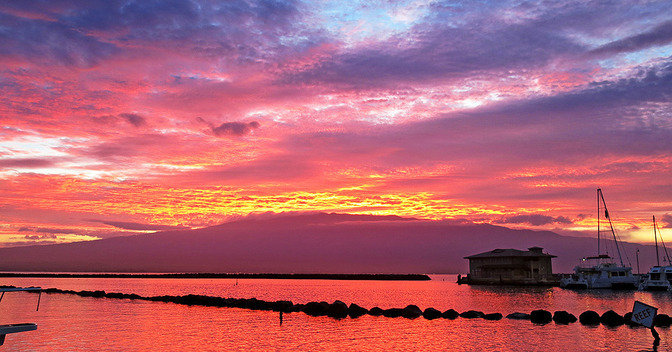 There's also free parking at the Maui Ocean Center located above the harbor. Just park as close as allowed to the shops located at the Maui Ocean Center. There is a stairway between the aquarium and the shops. Just walk down the steps and the Maui Magic is across the street, almost right in front of you. NOTE: Please patronize one of the Maui Ocean Center's aquarium, shops or restaurants if you choose to park at the additional Ocean Center upper-parking lots.